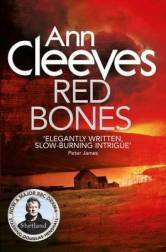 I've been catching up with some books I missed when they first came out, and it was a huge pleasure to pick up RED BONES by Ann Cleeves (2009). This British author is highly awarded (most recently the CWA Diamond Dagger) and her Shetland series -- four crime novels set in the Shetland Islands -- goes way beyond mystery, to probe the tragedies of individuals and families. Every page carries weight and loss, as well as the potential for redemption. No wonder it also morphed into a TV series, following Inspector Jimmy Perez as he learns the dark sides of the community he loves. She doesn't like the man, Perez thought. Then he saw her face freeze again. No, he thought with surprise. It's more than that. She's scared of him. Worth checking out this author's website, too; here's a link to the Shetland book series.